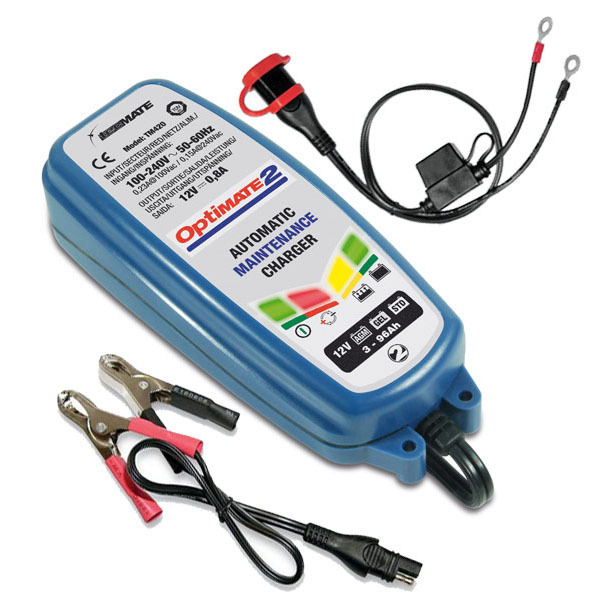 The OptiMate 2 smart charger-maintainer is the most cost effective solution for long term maintenance of a 12V batteries in any vehicle / craft that is stored in or outdoors. 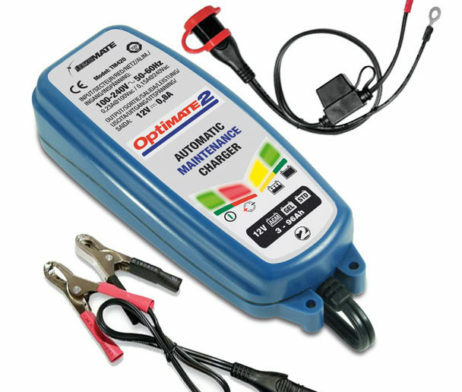 SKU: TM-420 Category: Battery Chargers Brands: Optimate. 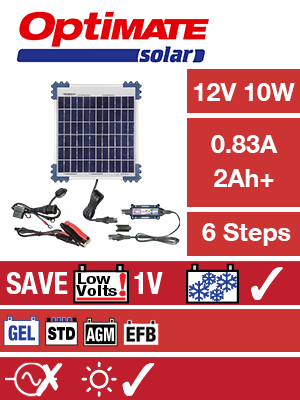 OptiMate 2 is weatherproof, very easy to use, simply connect to the battery and plug it into the nearest power socket, the rest is fully automatic. 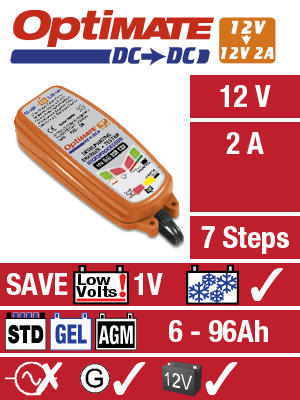 With 0.8A constant current OptiMate 2 automatically brings the battery to full charge and then switches to the unique OptiMate battery saving maintenance charge mode to keep the battery at 100% ready and at the same time provides power to the on board computer, display or anti theft alarm. 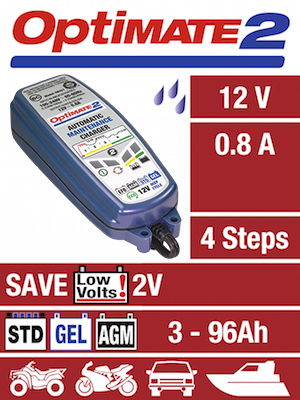 OptiMate 2 has been proven to extend battery life to 400%; batteries can last 8 years if maintained with OptiMate 2. To make this work always hook up OptiMate 2 to the battery when the vehicle is parked and OptiMate 2 will safely maintain the battery at 100%, never overcharging, thanks to its unique 30 min charge, 30 min rest cycle during every hour of long term maintenance charge. 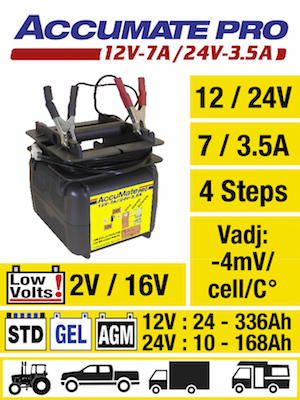 Recommended for STD (with removable filler caps), sealed AGM (absorbed glass mat) and sealed GEL 12V lead-acid batteries up to 50Ah, it can also maintain larger batteries (it will just take longer to charge). 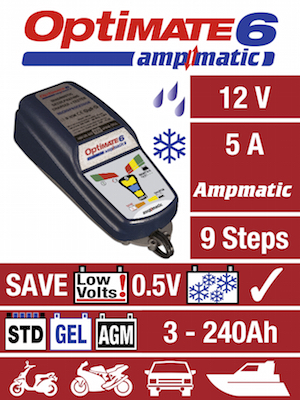 Weighing in at 1pound (450grams) including cables and accepting any AC supply between 100-240VAC, OptiMate 2 is a true world traveller.